Tuesday • August 14 • 2012 Volume 79 • Number 33 INSIDE: Bomgaars ? Sears ? Menards ? Employment ? Dining ? One In A VerMillion ? Presorted Standard US Postage Paid Permit #8 ECRWSS Vermillion, SD bp Broadcaster Press Postal Patron Local Since 1934 201 W. Cherry ? Vermillion, SD 57069 ? Phone: 605-624-4429 ? Fax: 605-624-2696 ? www.broadcasteronline.com K TO BAC “Prices good while supplies last” Tree Stands Trail Cameras starting at starting at 39.99 $ 89.99 $ Bow Packages Fully equipped with sight, rest, sting-loop, professionally set up, custom fit & tuned starting at 399.99 $ UPPLY S LIST Dog Training 3x12 Dog Dummy 11.99 $ Pheasant Training Scent 4.79 $ Dove Decoys $ Carrylite 4 pack 19.99 $ MoJo Wind Dove 12.99 $ MoJo Electronic Decoy 39.99 Goose Hunters... Take Advantage Of Winchester Expert Hi-Velocity Steel Shot Ammo 11.99 $ Dove Hunting Ammo $ Winchester 12 & 20 ga. lead 5.99 $ Federal 12 & 20 ga. lead 5.99 $ Winchester 12 & 20 ga. steel 8.99 Stop Up Now! Draw Big Bucks To Your Game Camera/Hunting Area With Mrs. Doe Pee Continuous Scrape Set $ 19.99 Smartphone Bow Mount NEW! •View shot placement •Records video from the Hunters eye view SAVE $30 On Every BDC Rifle Scope Now through 10/6/12. (Mail-In Rebate) Save Thousands of Dollars in Medical Bills! Protect Yourself with Tree Spider Speed Harness Treestand Fall Arrest System Ask Us How! 149.99 “Where the Buck Stops and the Hunter Shops! 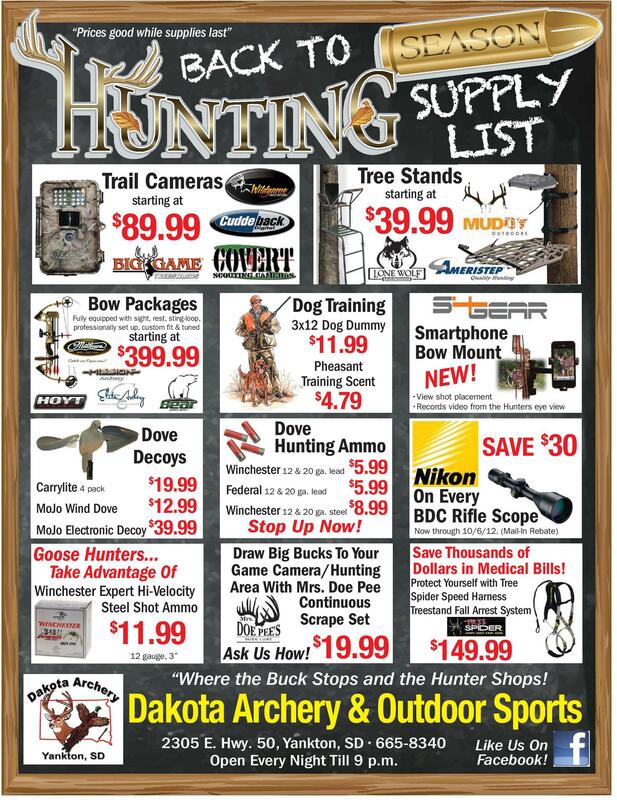 12 gauge, 3” $ Dakota Archery & Outdoor Sports 2305 E. Hwy. 50, Yankton, SD • 665-8340 Open Every Night Till 9 p.m. Like Us On Facebook!